A FARC Rebel Commander Runs For President. Many Colombians Aren't Ready To Forgive : Parallels After more than 50 years of insurgency, Colombia's most notorious leftist militant group has handed over its guns and formed a political party that's now fielding its first election candidates. 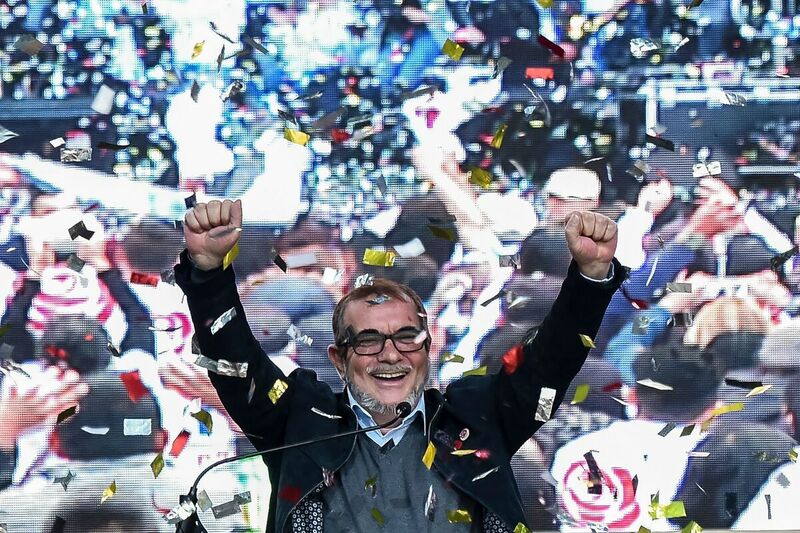 Rodrigo Londoño, a onetime FARC guerrilla commander known as Timochenko, launches his candidacy for president of Colombia in the Ciudad Bolívar neighborhood of Bogotá on Saturday. Rodrigo Londoño has been sentenced for taking people hostage, raiding an army base and recruiting children into his guerrilla group, the Revolutionary Armed Forces of Colombia, or FARC. Now, the former rebel commander is running for Colombia's top office. 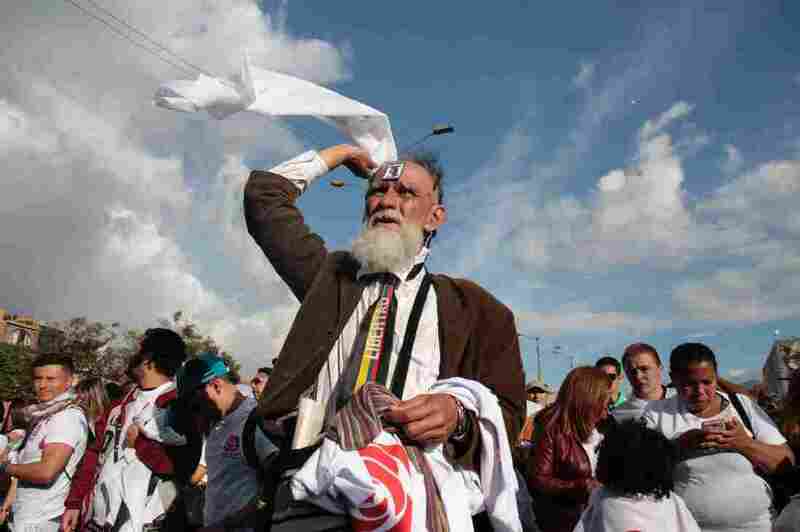 On Saturday, the 59-year-old former guerrilla leader waved at supporters from a stage set up outside a community center in Ciudad Bolívar, one of Bogotá's poorest neighborhoods. Amid tight security, a catchy campaign song and confetti blasts, he joined the race for the May 27 presidential election. "Colombia needs a new type of politics, that focuses on working people, on their human dignity, on their economic recovery," Londoño told a crowd of about 500 supporters who had come to see him speak. "We need a government that will represent the interests of the poor, one that will work for them nonstop." With Londoño as their presidential candidate, the FARC will be participating in elections for the first time since the revolutionary group was founded in the 1960s. The FARC became a political party last year, after signing a peace deal with the Colombian government in 2016 that ended 52 years of bloody civil conflict. They turned in their weapons to the United Nations — more than 8,000 guns and 1.3 million pieces of ammunition — in a successful disarmament process, changed their name to the Common Alternative Revolutionary Force, and are now trying to take over the government the legal way. With votes. As the FARC enters politics, its now disarmed Marxist militants have taken on a more moderate tone. Their logo, which used to bear two rifles, now has a red rose, a symbol used by some social democratic parties in Europe and the U.S. But while some people in Colombia welcome the FARC's decision to drop their guns and curry favor with voters, others feel it is too soon to see left-wing militants like Londoño — better known by his nom de guerre, Timochenko — on campaign posters. In more than five decades of battling the Colombian government, the FARC killed hundreds of civilians in attacks on rural villages. They kidnapped innocent people for ransom, littered the countryside with landmines and took a cut of the country's lucrative cocaine trade, in an attempt to fund their insurgent campaign. The group is still on the U.S. State Department's list of international terrorist groups. The U.S. ambassador to Colombia was quoted in September by El Tiempo newspaper as saying it was because the FARC hadn't provided enough information on drug trafficking routes. Instead of on the ballot, many Colombians would rather see FARC leaders in a courthouse or in prison, paying for their war crimes. "It makes me feel very uncomfortable to see them campaigning," said Joanna Jiménez, a hairdresser in the central Colombian city of Villavicencio. Her younger sister Vanessa Jiménez was recruited by the FARC in 2002 at age 13. In an attempt to protect Vanessa, Joanna Jiménez herself enlisted with the guerrillas and stayed in a camp, cooking for the rebels and collecting money for them for two years before managing to escape with her kid sister. The story has been documented by a Colombian government office that records victims' testimonies, an agency that's helped the older Jiménez sister rebuild her life. Vanessa was not as lucky. She was eventually found and apparently executed by the guerrillas for being a deserter. "I think the FARC leaders need to change their ways and answer for their crimes before thinking about presidential campaigns," Jiménez said. Carmenza Gómez, a Bogotá office worker who stumbled upon Timochenko's campaign rally on Saturday, said the emotional wounds of war are still too fresh for many Colombians. She said it was too early for them to run for office. "I think they should've waited some years, until more favorable conditions arise," Gómez said. A FARC supporter waves a banner during the launch of Timochenko's presidential campaign in Bogotá, Colombia, on Saturday. The word for "liberty" in Spanish is stamped on his tie. While a campaign by the FARC (the group's new name forms the same acronym in Spanish) may be controversial, it is absolutely legal. The peace agreement signed by the government and the FARC eliminated previous convictions handed to guerrillas by Colombian courts, paving the way for Timochenko, who had been convicted of 16 crimes, to run for office. The deal also ensures the FARC will take a minimum of 10 seats in congress for the next eight years. The former guerrillas will try to improve on that by putting candidates up for congressional elections in March. "The media have stigmatized us, and now we want people to know us better and listen to our proposals," said Sebastian, a young FARC supporter at Timochenko's campaign rally who refused to share his full name. 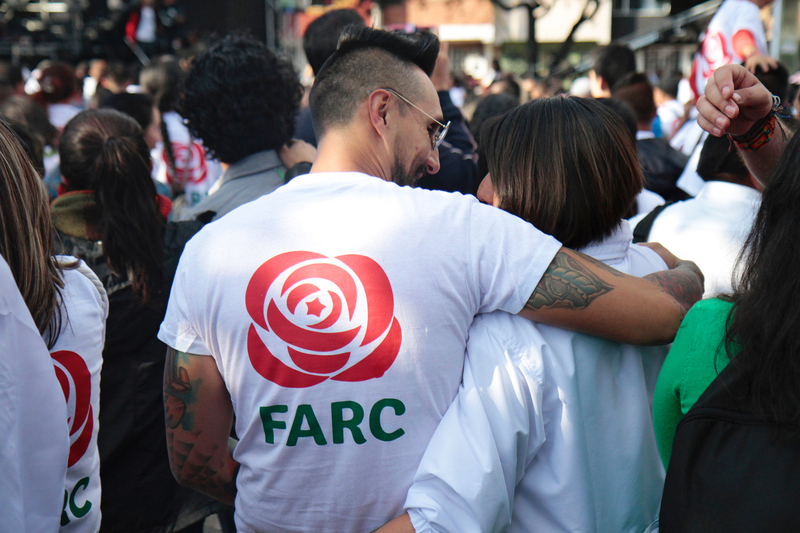 Sebastian said that for several years, he has campaigned for the FARC at universities in Bogotá, but was afraid to share his identity because the group's sympathizers are still discriminated against and sometimes attacked. Timochenko has promised to curb violence from radical groups if he becomes president. Despite the peace deal, a smaller, rival group of leftist militants is still fighting the Colombian state, and right-wing extremists continue to attack human rights activists in the countryside. They will initiate interesting debates on issues that mainstream parties have ignored, like the role that corporations have played in Colombia's armed conflict. Timochenko also said he would work to reduce income inequality, and proposed creating a guaranteed income for all Colombians, including for housewives and other caretakers to also be rewarded for their work. It's not exactly a radical communist manifesto. But Timochenko is still a fringe candidate. His support in opinion polls currently hovers at around 2 percent. Sergio Guzman, an analyst in Bogotá at the political risk company Control Risks, said the group's previous ties to violence hurt their electoral prospects. But he believes the FARC can still make a positive impact on Colombian politics. "They will have a small delegation in congress that will not be able to push legislation through," Guzman said. "But I think they will initiate interesting debates on issues that mainstream parties have ignored, like the role that corporations have played in Colombia's armed conflict." The FARC has also said it will try to ensure the government fulfills its end of the peace deal — including promises to redistribute land to poor farmers who were driven away from the countryside during the war. Ariel Ávila, who researches security and politics and is director of local think tank the Peace and Reconciliation Foundation, says as Colombians see the FARC working in congress, they will be more likely to change their opinions of the former guerrillas. "I think their presence in congress will promote reconciliation," Ávila said. "It will be good for people to see them in a new role, debating legislation and drafting laws."